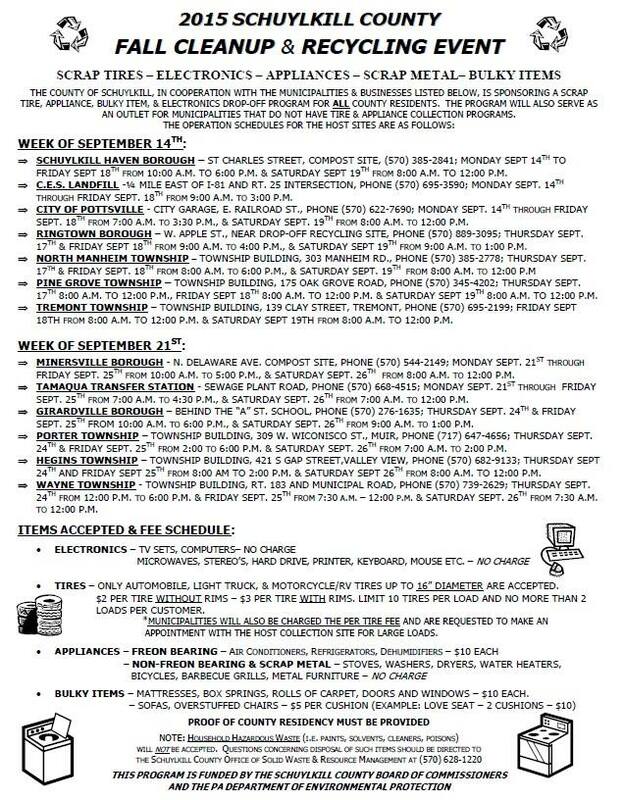 Tamaqua is holding its annual Fall Cleanup and Recycling event starting next week starting Monday, September 21, 2015 and ending Saturday, September 26, 2015. The event is being held as part of the Schuylkill County event, funded by the county board of commissioners and the state Department of Environmental Protection. Items can be dropped off at the Tamaqua Transfer Station, Sewage Plant Road, Monday, September 21 to Friday, September 25 from 7 AM to 4:30 PM and Saturday, September 26 from 7 AM to 12 PM. Participating municipalities for the week of September 14 include Schuylkill Haven Borough, C.E.S. Landfill, City of Pottsville, Ringtown Borough, North Manheim Township, Pine Grove Township and Tremont Township. Participating municipalities for the week of September 21 include Tamaqua Transfer Station, Minersville Borough, Girardville Borough, Porter Township, Hegins Township and Wayne Township. Scrap tires, appliances, bulky items and electronics can be dropped off at the Tamaqua Transfer Station, Sewage Plant Road, Monday to Friday from 7 AM to 4:30 PM and Saturday from 7 AM to 12 PM. Proof of county residency is required. Electronics, such as television sets, microwaves and computer systems, will be accepted at no charge. A computer system includes a monitor, a hard drive and one printer or scanner and peripherals. Only tires up to 16 inches in diameter are being accepted. It will be $2 per tire without rims and $3 per tire with rims. There is a limit of 10 tires per load and no more than two loads per customer. Freon bearing appliances, such as air conditioners, refrigerators or dehumidifiers are being accepted ($10 each). Non-freon bearing appliances and scrap metal will be accepted at no charge. Bulky items, such as mattresses, box springs, rolls of carpet, doors or windows, will be accepted ($10 each). Sofas and chairs will be accepted at $5 per cushion. Household hazardous waste like paints, solvents, cleaners and poisons will not be accepted. For more information about disposing those items, call the county Office of Solid Waste and Resource Management at (570) 628-1220. For more information about the Tamaqua area cleanup and recycling event, call the Tamaqua Borough at (570) 668-3444.